A significant part of the legacy of Goa Chief Minister Manohar Parrikar, who passed away on March 17 at the age of 63 after battling with pancreatic cancer for a year, is his eventful tenure as India's Defence Minister from 2014 to 2017 during which he got an opportunity to play a national role. An initially reluctant Defence Minister, who made no attempt throughout his tenure to hide the fact that his heart was in Goa, Parrikar turned out to be a hands-on helmsman of the Military establishment, navigating his way through the proverbial minefield with focus, finesse, and an easygoing charm. 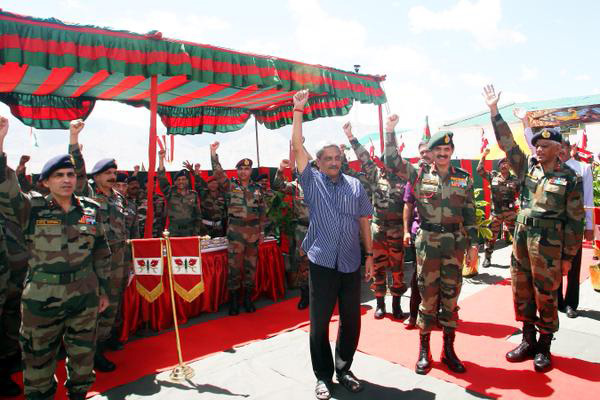 "India will be eternally grateful to Shri Manohar Parrikar for his tenure as our Defence Minister. When he was RM, India witnessed a series of decisions that enhance India's security capacities, boosted indigenous defence production and bettered the lives of ex-Servicemen," Prime Minister Narendra Modi stated on Twitter, paying tributes and condoling Parrikar's passing away. A rank outsider to New Delhi's political elite, this IITian with a reputation for political competence and integrity was unexpectedly brought into South Block in November 2014, with a principal mandate to clean up Defence procurements and prepare the ground for the Make in India agenda in defence production. But his first challenge as Defence Minister was implementation of the One-Rank-One-Pension (OROP) promise, an emotive issue for the military community. In handling this matter, Parrikar demonstrated quick administrative grasp of complex issues, and political nimble footedness in addressing tricky issues. On the day he took over as Defence Minister, he held out "fast decision making coupled with transparency" as his calling card, and immediately set about quelling any doubts arising from limitation of experience while coming from India's smallest state to the quicksand of politics on New Delhi's Raisina Hill. "For someone who's solved Goa's political tangles, no task is too difficult," he boasted charmingly. There were testing moments, when under his Ministership, surgical cross-border military strikes were launched, first against Naga insurgents in Myanmar in June 2016, and then across the Line of Control into Pakistan Occupied Kashmir as a retaliation against the killing of 18 Indian troops at Uri in Jammu and Kashmir in September 2016. There were other important initiatives like initiation of the cutting of flab, and restructuring the military for the future. He set into motion this process through the setting up of the Lt. Gen DB Shekatkar Committee to recommend measures to enhance combat capability and rebalance defence expenditure. Greater financial powers were delegated to the military for quick procurement of urgently-needed equipment, and building up of war reserves. In concert with the Ministry of External Affairs, the Defence Ministry under Parrikar shed the hesitation of the past to sign the Logistics Exchange Memorandum of Agreement (LEMOA), a long-pending foundational defence agreement paving closer military ties with the US. But it was the big push to reform the Defence Procurement Process (DPP) which will be the more enduring legacy of Parrikar's Defence Ministership. The 2016 edition of the DPP in a most defining manner sought to end India's dubious status as the world's largest importer of weapons, and firmly tilted the balance of procurements in favour of domestic manufacture. Parrikar also set in motion the introduction of the Strategic Partner Model to bring the private sector from the peripheries to the centrestage of defence production. Even as he did this, he supervised tough price negotiations with the French to clinch the Rafale fighter jet deal in September 2016. Other long pending, big ticket deals which were signed under his watch included the multi-billion contracts for the Apache and Chinook helicopters, and the tracked self-propelled and ultra-light artillery guns. Friendly and extremely approachable, he brought an easy going aam aadmi charm to the very stiff military environment. His turnout in crumpled bush shirts and everyday sandals at events which were defined by military ceremony, spit and polish initially horrified the forces, but they soon took to him as his sincerity and leadership shine threw his simplicity. Many observers saw him as the original Aam Aadmi of Indian politics. Within his simplicity, Parrikar was given to making colourful, off-the- cuff comments which drew much hilarity. The mantle of India's Defence Minister never weighed too heavy on him. He was known to complain privately that Delhi did not have a sense of humour, and kept his Goan sensibilities close to his chest. With his heart in Goa, he never struck root in Delhi. He would dart off to Goa every week, and many thought he was running the government there through a proxy. Laid back, in a very Goan way, but for Goa, a go-getter. Parrikar's humour and off-the-cuff remarks would occasionally catch the establishment by surprise. Like the one time, when he wondered aloud why India was binding itself to a Nuclear Weapons policy of No First Use. On another occasion, he advocated use of "terrorists against terrorists in Pakistan", and later dismissed Pakistan's angry rejoinder with the quip: "Inko Mirchi lagi hae, woh bhi Andhra ki (these people are burning with chillies, that too from Andhra Pradesh)!" A reformist who never took himself too seriously, Manohar Parrikar moved back from New Delhi's haloed South Block to India's smallest state as its Chief Minister without the least tinge of regret in March 2017. The general consensus is that South Block needed a reformist Outsider like him for a longer tenure for a more definite change for the better.